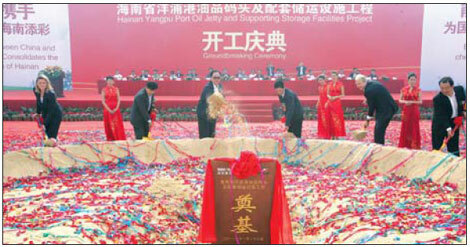 Ground-breaking ceremony for the Hainan Yangpu port oil jetty and storage facilities project, on Nov 28. Work began very recently on a crude oil terminal – as China’s largest commercial oil storage base – in Yangpu Economic Development Zone, is expected to serve all of South China and ASEAN countries as well. Work on the 7-billion-yuan project began on Nov 28 and is expected to be completed by 2015, according to its backers, the State Investment and Development Corp (SIDC) and Netherlands-based Royal Vopak Co. It is expected to have a combined capacity of 5.2 million cubic meters of crude and refined oil and chemical products. "This winning partnership between the SIDC and Vopak will benefit the ASEAN economies and Pan-Beibu Gulf rim and help Hainan’s growth and development," explained Li Bing, vice president of the SIDC. SIDC is China’s top investment company while Vopak is the world’s largest independent tank terminal operator. The two established a joint venture to handle the project in April 2009, involving an investment of 7 billion yuan. The SIDC holds a 51-percent stake, and Vopak, 49 percent. The development will take place at Yangpu Economic Development Zone on the southern island province. The Yangpu port is one of China’s highest-level ports, while the zone is China’s only national-level economic development zone with bonded goods policies. Jack de Kreij, vice-chairman of the executive committee of the Royal Vopak, is upbeat about the project, noting that, "The new Yangpu project has a strategic location for the South China and Southeast Asia market and an optimal investment environment." Vopak has 83 terminals, with a total capacity of 27.8 million cubic meters, spread across 31 countries. The current terminal Yangpu port is close to 19 oil refineries, so, the amount of crude oil could amount to as much as 90 million tons annually. By 2015, the crude oil entering is expected to hit 130 million tons. According to Li Guoliang, Hainan’s vice-governor, "This means large development potential for the project, and, after five years, the oil trade and oil refinery volume in the Yangpu area is expected to be worth more than 300 million yuan." When the first phase is completed, the crude and refined oil capacity will reach 1.32 million cu m. And there will be a 300,000-ton oil dock and 50,000-ton oil dock that can handle ships of from 5,000 to 375,000 tons. After the project is completely finished, it will have a capacity of 5.2 million cu m for crude and refined oil, and chemical products; and at least two berths, each with a capacity of 300,000 tons for very large crude carriers. The project will begin operations in the fourth quarter of 2013. The vice-governor also noted that the oil jetty and storage facilities project is part of the province’s contribution to China’s energy strategy. The scale of the oil storage base is expected to be in line with China’s strategic objectives. Industry insiders have said that the facility is equal in importance to national strategic storage facilities. The SIDC, which was established in 1995, handles diverse investments and has seen profits increase from 6-to-20 percent over the past four years. This year, its profits are expected to go above 9 billion yuan, according to Wang Huisheng, its president, in a talk with Reuters. Its investment in the Lop Nur potash fertilizer project is expected to see profits of 2 billion yuan this year. And, two of its coal docks in Bohai Bay are expected to generate profits of 1 billion yuan.